Thread Inserts: HeliCoil or Time-Sert? Joy-Jaw? Are All The Good Names Already Taken? For those woodworkers who like the hand-shaped look, the smaller curves on trim can be a nightmarish proposition — or at the least a time-intensive one. Enter the mini-sized spokeshaves from Garrett Wade. The set of spokeshaves feature brass wings on each of the three types of blades: straight, convex, and the third is shaped in-between for “all other possibilities.” The blades are made up of N2 grade steel and sport a shiny, steel knurled knob for the adjustment. Just position the tool where you need to shave, place a thumb on either wing, and push. The overall size from tip to tip is 3-1/2″ with a base that is 1-1/8″ x 5/8″ to better fit in tight spots. As with many things from Garrett Wade, they ain’t cheap. Anyone who must have a set will soon be separated with the better part of $40 before shipping. Those same shaves are available from several retailers… For example, Lee Valley has them for $25.50 + shipping. I used to own a set – they’re OK for their intended (very specific) purpose, but they’re fairly uncomfortable to use and somewhat tough to sharpen given the small thin blades. 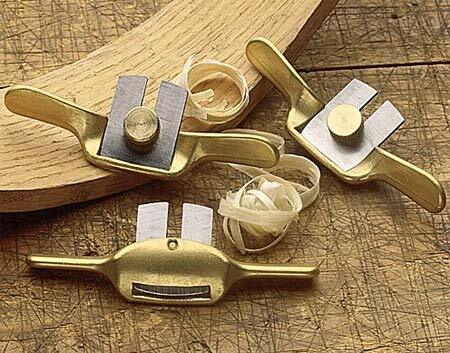 In general, I’d highly recommend a wood-bodied low angle spokeshave as a versatile, low-cost wood shaping tool. In my experience, there aren’t a whole lot of situations where a std spokeshave won’t work but one of these little bronze ones will… Of course, if you’re dealing with one of those situations, these are it. these are, I imagine a good tool to have threaded handles…that way you can put larger threaded inserts in to make the tool more user friendly. nothing’s worse than cramping your hands up just because the tool is too dang small for your hands…but I guess I really am an idiot in the woodworking realm. years ago garrett wade seemed like a good outfit, but they seem to have raised they’re prices and removed a lot of quality items from their stock. All in all, shop around and you can do better.